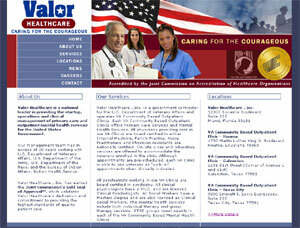 We have just launched a new web site for Florida based Valor Healthcare. Valor Healthcare is a government contractor for the U.S. Department of Veterans Affairs and operates VA Community Based Outpatient Clinics. Creating a clean patriotic themed web site was an important consideration in our design process. We teamed it with an inuative navigational tool for ease for use.